The Wizarding World of Harry Potter offers breakfast at the Three Broomsticks in Hogsmeade in Islands of Adventure park and at The Leaky Cauldron in Diagon Alley at Universal Studios theme park. Similar to lunch and dinner, breakfast at the Wizarding World consists of favorite items of Harry Potter and his friends. Breakfast items at Three Broomsticks in Hogsmeade include Traditional English Breakfast(complete with black pudding), Porridge, Continental Breakfast, American Breakfast and a Pancake dish. Don’t forget to add the Butterbeer or Pumpkin juice! Breakfast items at The Leaky Cauldron in Diagon Alley include Traditional English Breakfast, American Breakfast, Pancake dish, Apple Oatmeal Flan with Yogurt & Fruit and Egg, Leek and Mushroom Pasty. Children’s menu items are available as well. Guests who book a Harry Potter Package automatically receive 1 breakfast per person at both Three Broomsticks and The Leaky Cauldron. Since package guests also get admission to the Wizarding World of Harry Potter 1 hour early, the included breakfast is a great way to relax at the end of that extra hour. Breakfast is also available to general park admission guests on an availability basis only. So for busier times of year in particular, booking a Harry Potter package is the only way to guarantee breakfast at the Three Broomsticks and The Leaky Cauldron. 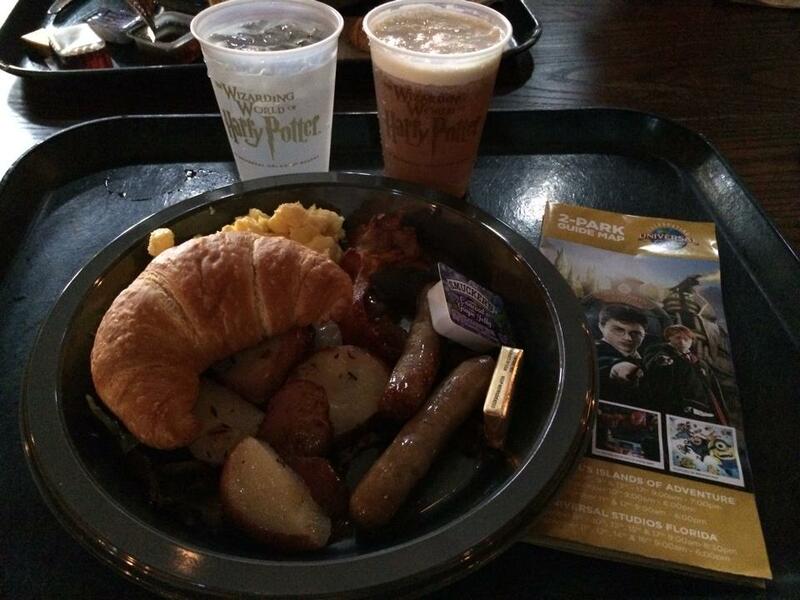 Be sure to check out the breakfast options at the Wizarding World of Harry Potter during your next visit!